[New for 2012, retired April 2013] Oh, Wonka Wonka Wonka, let's see a show of hands of who's read Charlie and the Chocolate Factory? Come on, get them up, it's not like anyone will notice. OK, let me count.... yup, that confirms my suspicions, you're all as crazy as me Mr. Wonka! Now, put those hands down so we can dig in! 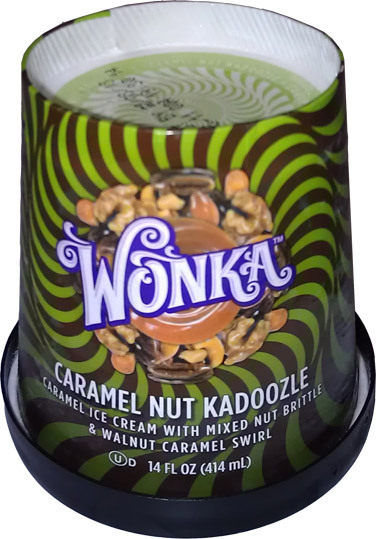 Less than two weeks ago, Wonka, the name that is now used to brand Nerds, Laffy Taffy, and a bunch of other candy from our childhood, has announced they are getting into the ice cream game. Brilliant marketing move? Yeah, I would say. 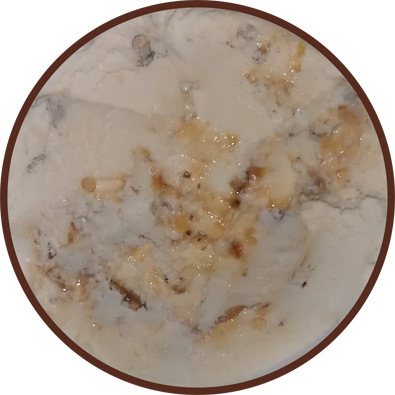 Ice cream has always been about fun and feeling better, so what better way to grab some market share then by introducing a truly fun ice cream. The only catch (bad news) is that it is only available to a small section of the west coast (mainly northern California). Luckily, the fine folks of the Wonka PR team agreed to send me a sample of each flavor. Big thanks to them for this opportunity to show you guys all the new flavors. Ok, I know you are just as excited as I am, so no more delays, let's dig in! 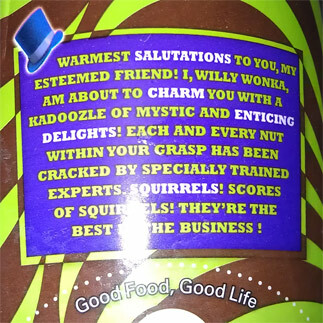 Caramel Nut Kadoozle - now, that's just fun to say! I wonder how they got all of them in there? Let's pop the seal and see what's inside. I think something exciting lies just below the surface. Oh, and remember, this is a caramel base to start. Oh sweet caramel, you are everywhere! 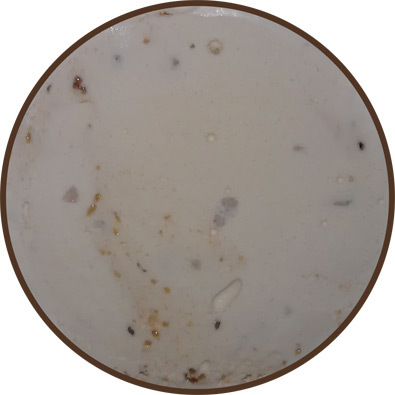 The greyish spots are chunks of the random nut mix. It's fun because one bite might have a hint of walnut, while the next has a hint of pecan. I can honestly say that I didn't expect to do much more than simply devour my first scooping. From the very first bite, I was hooked. 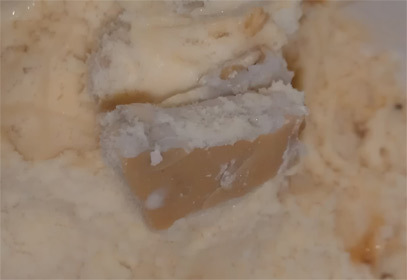 It's a top notch ice cream that is packed full of the caramel flavor (the kind that I had hoped was in TH Salty Caramel). The base and the swirl by themselves are a nice treat, but then you add in the brittle and I am all in. 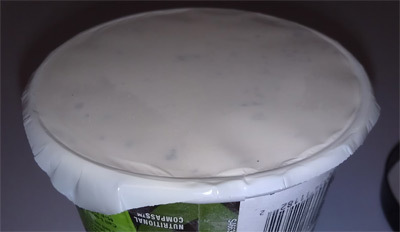 It's funny how you don't see a ton of brittle, but yet I seem to be crunching something on most bites. It's a nice sweet and salty crunch, too. Not too much of either, but it's there and it's really hitting the spot. I was afraid that I had set the bar too high for this treat but it's meeting my lofty expectations. It's soft, it's crunchy, it's sweet, it's salty, it's creamy, it's gooey. I had a very hard time putting the container down. I wanted to finish this faux pint in the very first sitting. but on occasion you might luck out and hit a nice sugary brick of nut brittle. Mmmmmm, so tasty! I wish there were more of these! You know what this one reminds me of? My beloved Crunch 'n Munch. It's just good and the people in the distribution zone of this one are lucky. Have no fear though, if the other flavors are even close to this good, I have no doubt that this one is going national. On Second Scoop: I couldn't wait to dig into this one Friday afternoon and again it didn't disappoint. It's just different and fun. There's really only two big observations I can make. One, I would love more brittle, but it's only because it's so tasty that I really wouldn't mind more of it. The second thing is the aftertaste. 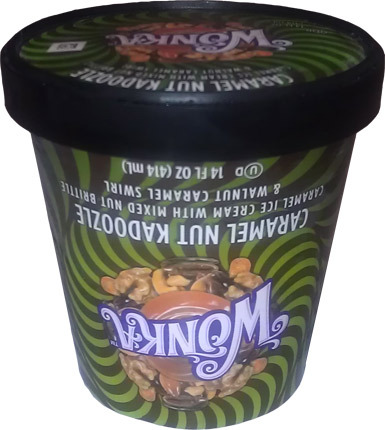 It's not bad, but it's a neat change because you work this nice caramel flavor as you are eating, but the second your serving is done, you are left with a very nutty taste that slowly fades. It's not bad, it's a good different and makes this one all that more special. So there you have it, our first look at Wonka and it's a doozy, or should I say Kadoozle? I know I should go more in depth with my descriptions, but I was having such a good time that I scooped right through this one. Awesome job to Nestle for using their Dreyer's resources to pump out these "pints". Please adopt me so I can have access to your ice cream freezer. You can re-name me Kadoozle. I suppose it's okay if it's on sale, or in your case, free, but $4.99 for 14 ounces (less than a pint)seems kinda high .. It's good - okay .. but is it worth the price? I'm hoping $4.99 is MSRP, much like it is for B&J or H-D. With that said, I will still pick this up at $4.99, just not as often. Awesome! I've been real excited since I first heard about this stuff, I'm so glad it's good! Yes! Thanks for the great review, nice pics and such, as always. Hey Rodzilla are you in San Diego like myself?